The Casino Association of South Africa (CASA) represents the interests of the country’s legal casino gaming industry, as well as the growing public that the industry serves. This industry supports over 64,000 jobs and in the financial year 2015/16 contributed R5.9 billion towards tax revenue in the form of gaming tax, value added tax and corporate taxes. By representing 92% of all legal casino operators, CASA actively champions good governance and constructively contributes towards policy decisions that encourage growth and investment in the industry and South Africa. 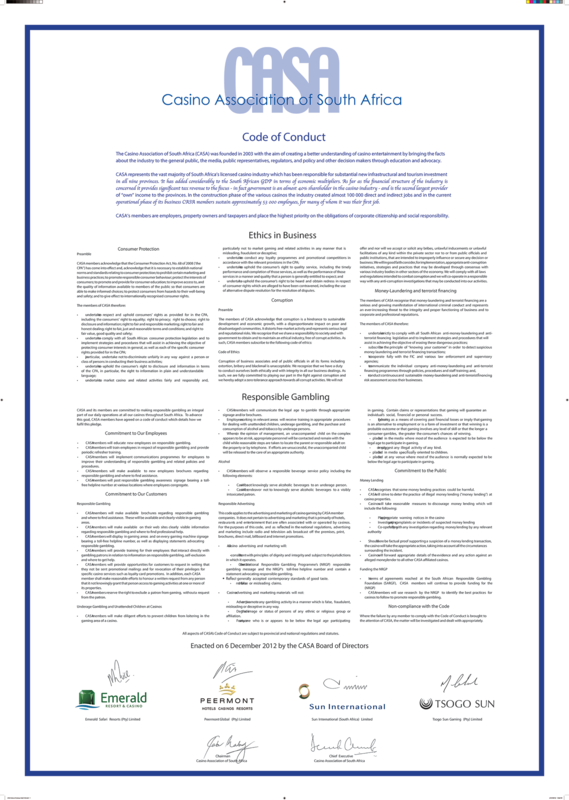 Our members adhere to the CASA code of conduct. You will need Adobe Acrobat to read some of these documents – click here to download Acrobat Reader free of charge. Downloadable content in one central location.